Custom fields codes all begin with a leading underscore character. For this reason, Custom Field Admins are encouraged to keep their folder names and field code names as short as possible. Where to find custom fields available and search the data. Zoom: Where to find custom fields available and search the data. 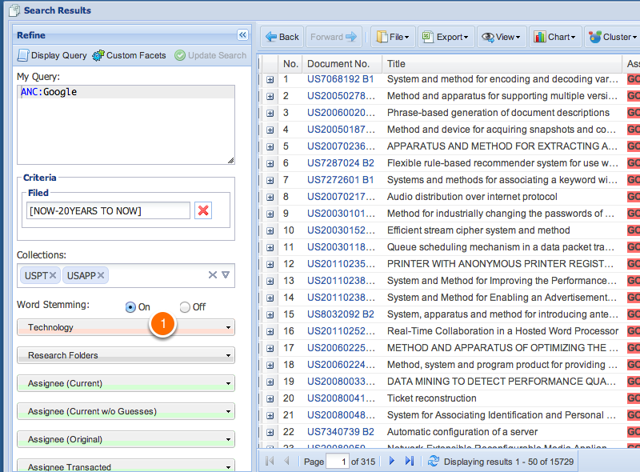 Custom field data appears in a grid in the right side of the document details window. Like other grids in AcclaimIP, you can click the Field headers (1) and expose or hide additional field-columns by checking the available check boxes (2). 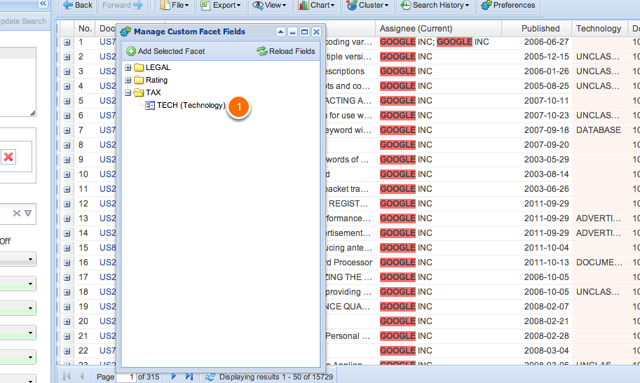 Notice the field codes are stored in a column outlined in Red above. Label: Easy to undertand short description of the field. Value: The value column holds the custom data. Error: Tells you if there is a problem, such as typing a number that is outside the allowed range. Field Code: Displays the Field Code you use to query the custom data field. It is important where to remember to reference the field codes. Field Type: Shows you what type of data you can input into the field. Permissions: Shows you if you can READ, WRITE (meaning read and write), or BULK (if you are an admin and can upload data in bulk to the field). You will likely want to expose the Label and Value fields, and occasionally the Field Code field so you can reference which code to use to the query your custom fields. 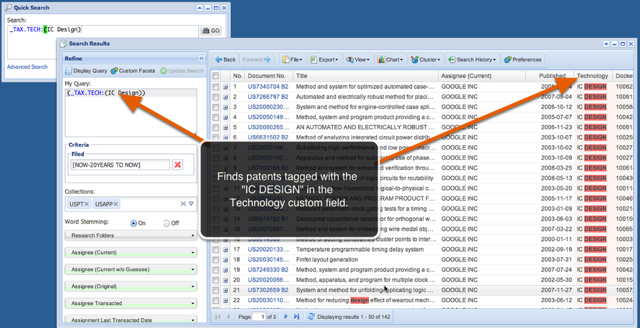 In this example, I tagged some Google patents with a Technology Code that might represent business units, technology groups or other subdivisions of your business or organization. These data are fictitious, and this is NOT Google's private data. It looks plausible because I designed it that way for realistic examples. All custom data is highly secure, stored in a private search core, and only available to users who your administrators authorize. 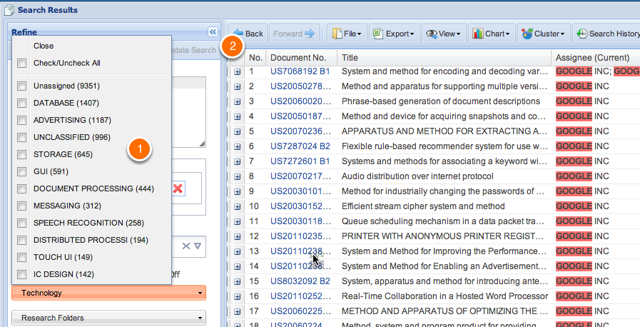 To search, enter the field code and the data value you want to search. The syntax is identical to any other data you may search in AcclaimIP. Custom Fields can become faceted filters. (the counts are the facets). I want to open the Technology facet which is in the TAX folder. 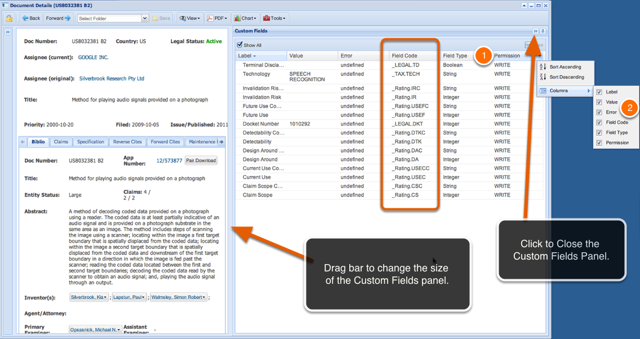 Open the folder and double click the filter you want to add to the Refine panel. Custom filters/facets (1) appear at the top of the filters in the refine panel and are colored orange. The filter works like any other filter in AcclaimIP. The example above you see the various facets in the Technology filter (1). Check which facets you want to view and then click the Update Search button (2). 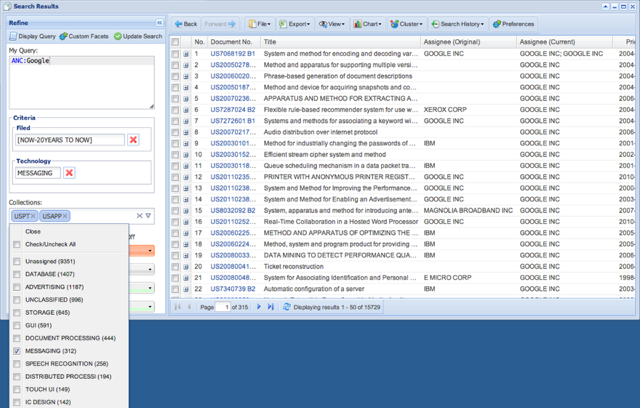 In this example, I crunched up a Document Details window so you can see the Field Codes and the query in the Quick Search window at the same time. ANC:Google --> Patents currently owned by Google. AND _RATINGS.DET:[3 to 5] --> With a Detectability rating from 3 to 5. AND _RATINGS.CU:5 --> with Current Use rating of 5. 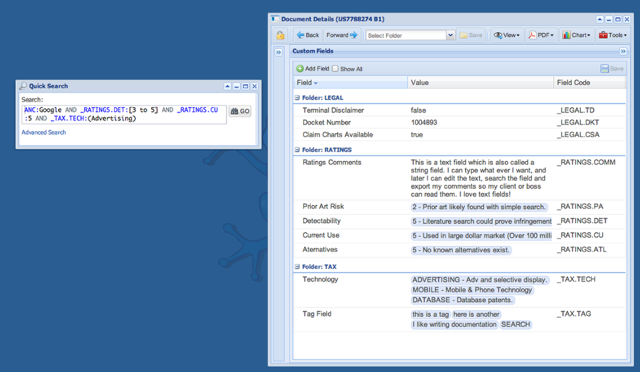 AND _TAX-TECH:(Advertising) --> manually classified as related to advertising. The query runs just as fast as any non-custom field. Notice the query is echoed in the My Query window, Current Use are all 5's, Detectability is from 3 to 5, and all patents returned were manually classified as Advertising patents.